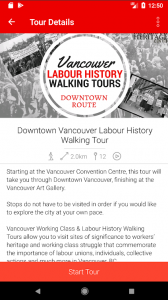 May 28, 2018 – Available today, the app BC Labour History Walking Tour offers a journey back in time in British Columbia to iOS & Android device users. It allows locals as well as travellers to visit sites of significance to workers’ heritage and working-class struggle that commemorate the importance of labour unions, individuals, collective actions and much more. 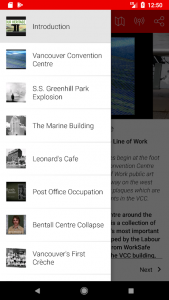 With content based on our existing labour history walking tours, users can download routes directly to their device, allowing them to load content while connected to Wi-fi before heading out on a tour to avoid mobile data usage. 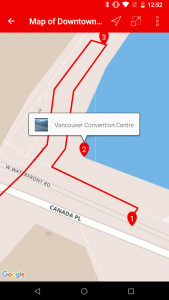 Tours can be explored remotely through the navigation bar, or on-site by turning on the Location & Online Maps feature of the app, which will notify the user of nearby stops and provide directions on the walking tour route. Each stop contains historical information, along with historical photos and at certain locations, short educational videos to enhance the experience. New locations and routes will be added regularly to expand and include routes around the province of BC. The app is only available for download in Canada and is completely free. It is available in several languages based on the user’s device settings. Please visit us on the Google Play and Apple Store. 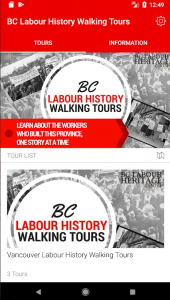 The BC Labour History Walking Tours app is created by the BC Labour Heritage Centre through the MyTours platform, developed by Authentic.